Are you in need of a Business loan? 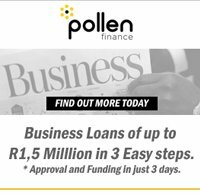 We provide assistance through one of the best-known business loan providers in South Africa, called Pollen Finance. They offer Business Loans of up to R1,5 million in three easy steps and approval and funding in just 3 days. Their loans are repaid over a standard 26-week period, with the outstanding loan amount and upfront interest charge repaid in weekly debit order instalments. *Startups do not qualify. Simply complete the enquiry form below and they will get back to you with all the information and provide assistance with your application. 1. Apply with the form above - Simply enter your details and one of the consultants will get back to you. 2. Submit documents - Submit all the relevant documents as required, to determine if you qualify for the business loan. 3. Get your loan - If approved, funds will be allocated to you. Please feel free to contact us on info@dryk.co.za, if you have any questions or need assistance with your application.